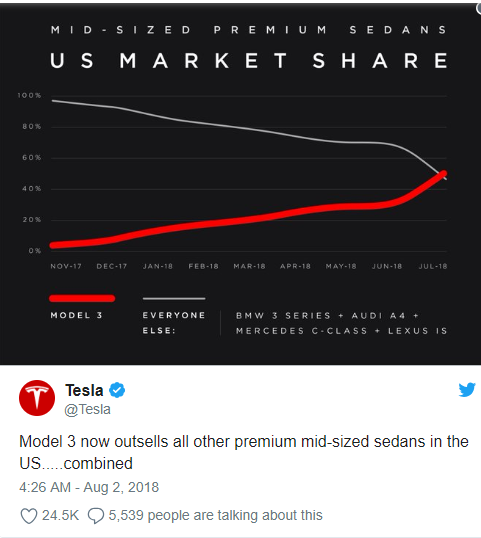 Tesla released a graph pointing out that the Model 3 outsold all other premium mid-sized sedans in the U.S…. combined. 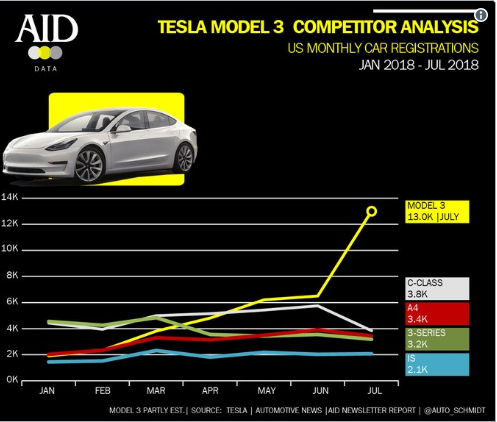 In July, Tesla Model 3 sales exceeded 14,000 units. If Tesla doubles output to 10,000, it will take not 50%, but 75% of the mid-sized premium sedan market. The Tesla Model 3 is a mid-size (US) luxury all-electric four-door sedan manufactured and sold by Tesla, According to Tesla officials, the Model 3 Standard Battery version delivers an EPA-rated all-electric range of 220 miles (354 km) and the Long Range Battery version delivers 310 miles (500 km). The Model 3 has a minimalist dashboard with only a center-mounted LCD touchscreen. Tesla stated that the Model 3 carries full self-driving hardware to be optionally enabled at a future date.